Reading, writing, arithmetic. These logic and linguistics-based subjects are the backbone of our educational curriculum today but studies are showing that they are often complemented by the use of creative artistic subjects, like dance, to enhance academic subject understanding and knowledge. ClancyWorks’ dance professionals work with teachers and school administrators to craft a tailored in-school residency plan based on our highly successful ASPIRE program to help students achieve greater academic knowledge, build community awareness and social skills, improve attendance and focus, and address 21st century learning skills. Our residency programs can have an arts integration focus (when dance is taught with academics) or a performance focus (through partnering experiences and choreographic commissions). The program kicks off with an assembly performance by ClancyWorks Dance Company, and then continues with a series of classes based on a tailored curriculum plan, created in partnership with the classroom teachers. 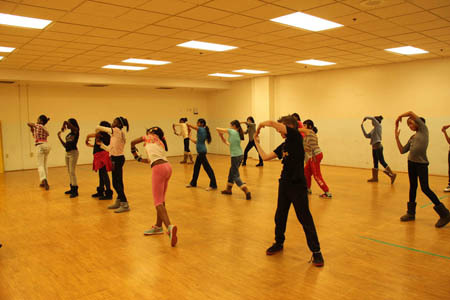 Students learn technique, vocabulary, history and culture for different styles of dance including hip hop, step, jazz, contemporary modern dance, partnering and Latin dance styles. They apply this knowledge to create and perform meaningful movement patterns. Additionally, the classes highlight leadership such as the importance of community, teamwork, collaboration, and positive group interactions through dance partnering. In addition we focus on life and job skills, and we value a nurturing and supportive environment that balances discipline and rigor with fun. The program culminates with an informal performance showcase by the students, to demonstrate their knowledge gained during the residency, for family, fellow students, teachers, administration and community members. Arts Integration: Incorporates specific academic curriculum objectives with dance linked to national and state standards for both dance and the specific academic subject. Partnering Into Performance: Uses movement exercises and dialogue to teach students that partnering with others can help them accomplish greater goals than they could individually. Students are showcased in final performance. Choreographic Commissions: A ClancyWorks Company Member works with students to create a dance piece incorporating ClancyWorks partnering techniques and repertory. We tailor our residency programs to the unique needs and circumstances for each school and classroom. We also offer our ASPIRE dance program approach in an afterschool program format. Contact us today to arrange a residency dance program, led by ClancyWorks professional dancers and using our highly acclaimed ASPIRE program, for your students today! ClancyWorks staff can assist your school to identify grants and funding to make this program possible.